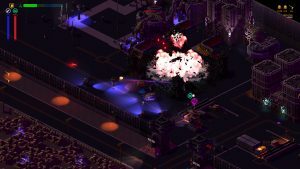 I had the good fortune to ask a few questions of Hugh Monahan from Stellar Jockeys, co-creators of the stylish and action-packed Brigador, and these are his revelations about the game’s past, future, and the difficult road he and his studio have had bringing it to life. While this certainly isn’t what frames every indie developer’s experience, it’s certainly a good look into the kinds of difficulties many smaller studios find themselves dealing with, especially when they’ve yet to ship their first game. MJR: We posted our review a little while ago, but just in case some of our readers haven’t checked it out yet, why don’t we start with a quick rundown on what Brigador is? Hugh Monahan: Brigador is an isometric mech action game, or more legibly we just call it a Kool-Aid man simulator. Tactical combat in a fully destructible environment with plenty of customization and mechanical density for people to get into. I’ve been curious to hear more about how Stellar Jockeys got its start. And why do you and your brother have separate branding despite working together on the same project? The company started very organically. After finishing college I spent some time teaching high school and in my spare time started working with students from the University of Illinois’ gamebuilders club to cut my teeth on game design. None of us really knew what we were doing but we had a good mix of guys and within a year we’d made a wonderfully terrible Star Control clone. That whet our appetites for game development, and after a lot of hemming and hawing, two of the members from that original team and I ended up starting Stellar Jockeys together, which would have been the summer of 2011. My brother Jack at the time was doing his own independent work, which included an impeccable blog on game design called Design Reboot, which is also where he formalized his work/business identity as Gausswerks. We realized it was a bit ridiculous for the two of us to be working on two different independent games at the same time, so after a long chat we decided to throw in together. Gausswerks is included as a co-developer on Brigador in the case that should the two of us end up working on separate projects he has an already-established reputation. In the meantime, though, we’ll keep collaborating. Ideally we can end up in the hallowed ranks of artistic pairs like the Coens or Nolan brothers. I used to play tabletop Battletech and Mechwarrior as a younger man, and I also have fond memories of the now almost entirely forgotten Epic classic Fire Fight. I have to imagine you guys share a similar heritage. What inspirations led you to create Brigador? Wow. So we were introduced to a lot of games we’d never heard of before, including Desert Strike, Future Cop: LAPD, and MechWarrior 3050, but this is the first time I’ve seen or heard of Fire Fight. It’s a curious thing as most of the games people site as touchpoints for Brigador were ones we were completely unfamiliar with during development, and frankly our direct inspirations run much further afield. As far as games go, Syndicate, Crusader: No Remorse, and Mech Commander were the most direct influences. However, there were also design tenets from seemingly unrelated games that played a fairly major role in our design methodology. For example, the ‘Carmack rule’ (spamming ‘enter’ gets you immediately into gameplay) is something we held to. We did our best to flesh out the world and story for players, but we also didn’t want that work to bog down the game itself, which is why you find the more traditional linear narrative is almost entirely absent. 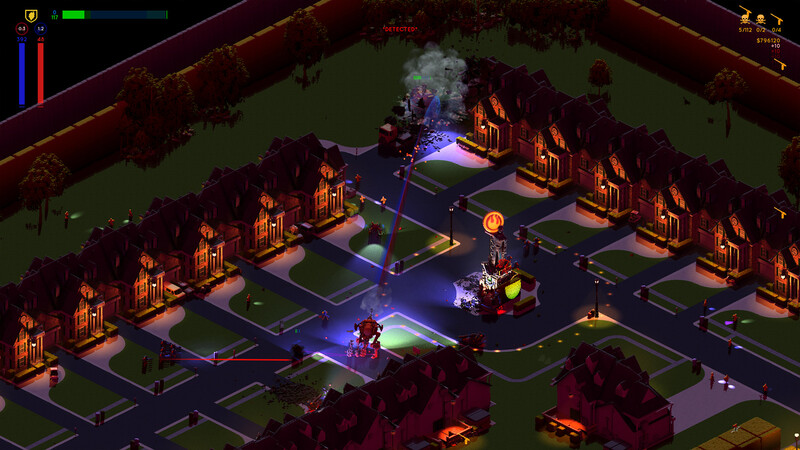 Brigador is a game about destruction, and we wanted that to be the focus. There’s plenty of story if you look for it, but we offloaded that to descriptions and to the book/audiobook we produced alongside the game. I’m also incredibly curious about your inspirations on the fiction front. Brigador’s world is a provocative one that I really enjoyed digging into, and I loved the bleak, future-corporocratic tone of so much of the writing. What spoke to you when you started creating this universe? Aesthetically and tonally the original Alien and Blade Runner are of course major touchstones. Terry Gilliam’s Brazil is worth mentioning here as well. Both my brother and I are fans of those alternative forms of future-tech, though the difference is that at the time those films were produced the technology and particularly computers depicted seemed like logical forward projections of future technology. By contrast our work in establishing the Brigador universe knowingly departs from a ‘realistic’ take to a more stylized one—something the Fallout series did in its own way with great success. There’s something about the late 70’s, early 80’s understanding of what the future held that we find captivating, something about the blocky tech and massive, fuzzy CRT monitors that possesses unique substance. It also helps that these instincts happen to coincide with a lot of design trends coming back into vogue. Jack in particular is an avid fan of Kow Yokoyama’s Ma.K. and its kitbash style, which influenced not only our aesthetic but his art production pipeline as well. The process he developed for digitally kitbashing models to create game assets is the only reason we were able to complete the game with a single artist—his method was so efficient that our turnaround time by the end of the project for taking an asset from concept to integration in the engine was less than a day. I’m also a big fan of the Ma.K style, and a term like “digital kitbashing” says so much about the look of Brigador. That’s very cool. But back to fiction, you guys actually went so far as to hire Brad Buckmaster to write a novel to accompany the game, which got quite a good audiobook rendition as well. It’s a nice surprise given how often game development neglects writers. How did that relationship come about, and have you guys been pleased with the end result? Brad and Jack became friends through a mutual appreciation for obscure 20th century military hardware, which led into Brad’s involvement as a kind of ad hoc consultant on the game. The man is a veteran of multiple military tours and has an exhaustive knowledge which greatly aided us in developing the world of Brigador. As we got further into the process, we learned he was also doing his own writing, the Contractor series, which read very closely to how we’d have wanted a Brigador novel to turn out. What originally was a pie in the sky idea for Jack and I was quickly formalized into a proper work contract with Brad, and we couldn’t be happier with the result. The idea of adapting it as an audiobook came after the first draft was finished—we like it so much we wanted to ensure as many people as possible would read it, and an audiobook adaptation was the best way to go about that. Enter Ryan Cooper, who did an equally impeccable job on giving voice to Brad’s writing. It was better than I expected it would be, and I’d definitely recommend anyone interested in the fiction to take the time to listen. Actually, one of the things that interested me about the Brigador itself and the book was that the tonal and audiovisual aesthetic feels really directed and consistent throughout. It can be tough to get something that seems so single-minded out of people working on different moving parts of the same project. How much of that was a concerted effort, and how much was serendipity? There’s always a degree of serendipity when it comes to finding collaborators that you mesh well with; in that regard we were extremely fortunate in that across the board the guys we worked with immediately clicked with the project. Generally speaking when we work with contractors we want to be as hands off as possible—establish what the world is and what we’re trying to accomplish, then just let them roll. It’s what we did with Makeup & Vanity Set for the soundtrack and it’s what we did with Brad Buckmaster on the book. In both cases the majority of our input was “this is really good, keep going.” Part of that just has to do with having really talented guys to work with, but part of the onus is also on our end in providing the best circumstances for people to succeed. There are certain cases where you need to micromanage, and for the most part I tried to just handle those elements directly. With both the OST and the book we trusted the instincts of our collaborators and didn’t need an exhaustive set of parameters to be fulfilled, so they had the freedom to pursue the work as they saw fit. We couldn’t be happier with the result. So Early Access sometimes seems like a roll of the dice for indie devs. What lessons did you learn from doing your first game this way, and would you have done anything differently in hindsight? As far as the explicit design of the game, Early Access was a great boon. It showed us there was a great demand for a more directed ‘campaign’ style mode, and also showed us that there was an appetite for the world and lore we’d created up to that point, so we were encouraged to keep pushing along those lines. Unfortunately EA also introduced a lot of difficulties from a marketing and publicity side—in retrospect I wouldn’t have announced the EA launch at all and just kept our heads down and worked. The problem is that unless you’re a big fish, there are only so many times you can get media outlets to cover you, and we spent a lot of that capital when the game wasn’t ready for showtime. From what I saw during earlier periods of the game’s development, it took quite a bit longer to get to release than you initially anticipated. What were some of the biggest unexpected setbacks? There were no major moments where it was like “this thing didn’t work and set us back a year!” It was more just a combination of working together for the first time as a team and the tremendous iteration time required in coming up with new styles of gameplay and production. There were multiple things we simultaneously built that were extraordinarily demanding—a new 3-space aiming scheme in isometric space, gameplay centering around fully destructible environments, a new art pipeline based on digital kitbashing and sprite rendering, and achieving all the former points in an engine we were building from scratch. You made a post that got some traction about how hard it is to get noticed as an indie developer, and that even building something you’re proud of isn’t always enough to move product without reaching a wider audience. How have things gone since you made that post? Better, but still a long way to go. Ironically the posts about not getting attention have been what, at least from a sales point, have gotten us the most attention. The reality is that it’s a hard market where nearly everyone is scrabbling for attention—combine that with large discounts on fairly recent and established games and it’s very hard to convince people to give a new developer the time of day, both from consumer and press standpoints. A lot of indie devs struggle with that issue, and it sometimes really does lead to heartbreak when what somebody has invested just never gives a return. Is there anything your experience with Brigador taught you that would help other devs trying and failing to break into the wider market? At the beginning of the project I naively thought it would be a Field of Dreams scenario for us, but the more I see of the games industry the more I believe that isn’t the case for anyone. Whenever you see something going viral, particularly with games, it’s very rare for that to be a truly, I guess naturally viral thing where the developer didn’t have a hand in it and it just happened to blow up. Rather it’s a case of continuous cultivation. My price post on Steam probably wouldn’t have gone viral if I hadn’t tweeted it out and messaged some press about it asking their opinions. If something looks effortless, in my experience it’s not because it is effortless, you just can’t see all the work that’s gone into it. Entirely agreed. Either way, I think Brigador is a strong title with a lot going for it, but it also seems like there’s room to expand upon that foundation if you were given the opportunity. Do you guys have any big plans for Brigador’s future? Our hope is to continue making games in the ‘Briga-verse’ for the foreseeable future. Once the dust settles on your first game, are there other projects you’re burning to undertake? I’d love to do a “Brigador: Tactics” in the style of something like Front Mission / XCOM / Advance Wars, but that’d be an enormous project. It might still happen, but that’d be down the road once I’ve recovered more from the 5 year ordeal of developing our first game, and hopefully with a bigger team on hand. 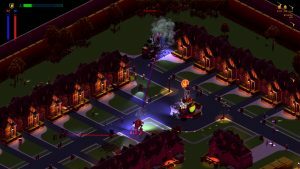 For more on Brigador, check out Stellar Jockeys and Gausswerks, read GoombaStomp.com’s review, or head over to Steam to get a copy of the game for yourself! Michael J. Riser writes weird fiction and articles about videogames. He occasionally posts stuff at Bookruptcy.com, and (more frequently) @Quemaqua on Twitter. Thanks for the interview. I’ve been playing Brigador since EA and it’s great to see these guys get as much press as they can, they deserve it. It’s a great game, and I certainly hope it gets them the base they need to keep going strong. Would love to see them explore that universe further!